I slammed on the brakes and came close to having an accident. Some would see this as overreacting to a change of typeface, but, while I have nothing against Helvetica* — an excellent typeface with many appropriate uses — you can probably see how the stark, blocky, white on black sign when I was expecting the usual Renaissance red and gold and sensual curves was a bit of a shock. I suffered every day for a week, wondering what was going on. Under new management, maybe? But why would they mess with a good thing? The story ends happily: it appears it was a temporary aberration. The day before Hallowe’en, new illuminated signs went up. My design sensitivities are soothed. *Later: Anonymous (see comments) pointed out that I had not looked closely enough. The temporary sign was in fact done in Arial, the version of Helvetica widely used in word processing. See the difference in the “a,” below. This entry was posted in Typography by anmaru. Bookmark the permalink. 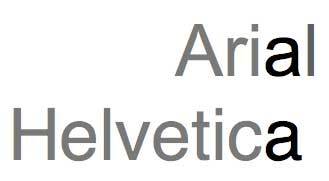 erm, that is not Helvetica. Look at the tilted vertical endings of all the letters – its clearly Arial, the imposter. Quite right, Anonymous; I didn’t look closely enough. Some of the letters are more obviously tilted than others, so I compared two of them in my update. I’d say that, even if much better than made in Arial, the last photo shows that they clearly smashed the font, which is for me as much unacceptable as having used Arial… don’t you think? You’re right; it is definitely kind of squashed! And I can’t see any good reason why. Instead of thinking about the whole concept, they just put the font and realised that it didn’t fit… so, what’s the easiest way to make it fit? To smash the font… unfortunately, quite a lot of people do these things!